Well hello there folks! It's been a loooong time since I last blogged. I've been super busy with my Etsy shop and learning all about brush lettering and how to use Adobe Illustrator. I'm thoroughly enjoying the process and still have so much to learn, but I have missed this space. Hopefully, I'll be back a little more regularly now I've (sort of) found my feet - I've got quite a few photos to share before the end of the year! 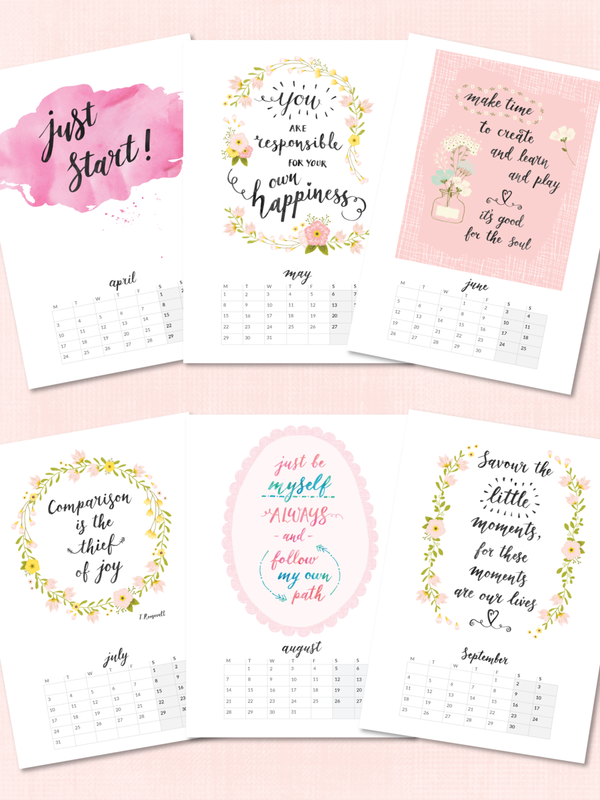 I set myself the goal of creating a series of inspirational quote prints using my brush lettering - the kind that I would love to have on my walls to gently uplift and encourage - and enough to make a calendar, before the end of the year. I'm happy to say I got there! I even managed to create a couple of photography calendars as well. NB. All the inspirational quotes you see here are also available as printable downloads individually in A4 and 8"x10" format. US letter 2 months per page (desk calendar). They are all designed as printable downloads for you to print at home - it means you save on postage costs, AND you can print them as many times as you like - perfect stocking fillers :) I've been really happy with the results from my very standard inkjet printer, using a nice 200gsm matte photo paper. I'll give you three guesses what Christmas presents I'll be giving this year! Although they're not bound, you can display them in lots of different ways. My favourite is simply with a clipboard or pretty bulldog clip and a bit of cardboard - you can prop them up on your desk or hang them on your wall. Or you could hole punch them and thread some twine or ribbon through. Or simply washi tape a page to your wall each month. The choice is yours! Given that I'd invested quite a bit of time creating all the different calendar formats, I thought I'd create a couple more versions using some of my favourite photographs. I always have a calendar on my desk as I'm constantly checking dates as I plan my life, and it's so lovely to have some cheery images or uplifting quotes staring back at me every day. And I just love that feeling of turning over a new page in the calendar for a shiny fresh new month, don't you? So there you go! I hope you like them. To celebrate their launch, along with Small Business Saturday here in the UK, I'm offering a 20% discount code off everything in my Etsy Shop from Friday 02 Dec - Mon 05 Dec 2016. This will be the only discount I offer before the end of the year. Use code TAKE20DEC16 at checkout. I'm delighted to say that some new printable desktop calendars for 2016 are now live in my Etsy shop. To start with I've designed two variations: an Inspirational Quotes version and a Blythe version. Moving into the printables markets is a new venture for me, and one I'm pretty excited about. I think buying digital files that you can print yourself at home is such a great idea. You save a lot of money, especially postage (great for international buyers) and there is no waiting for items to arrive. Plus you can print them out more than once and gift them to friends. Have you bought any digital items for printing before? I'd love to know what you think. 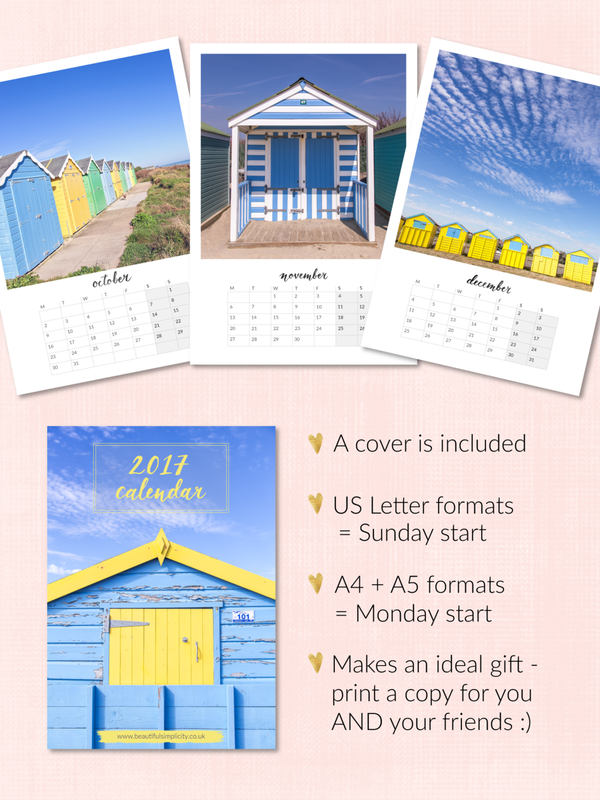 These calendars are available as a 7 page PDF file (both A4 format and US Letter format) with two months per printable page, plus a cover and a back page. You simply print them them out and then cut them in half. They're designed as Desktop Calendars and look great sat on a plate stand (the one I've used in the photo below is available from Amazon here) or on a clipboard propped up on your desk. If, like me, you don't have a clipboard, then a bit of cardboard with some pretty paper (from Flow Magazine) and a bull dog clip works very nicely :) Plus, you can change the paper to suit the photo - cheap and very cheerful! I'd love to know what you think. What other designs would you like to see? I'm pondering a beach hut version, or maybe some seascapes or a nature themed one. I'm also wondering whether people might like an A4 wall calendar version as well? Do let me know in the comments - thank you so much! I'm delighted to say that my Etsy shop is now re-open and stocked with my new range of inspirational quote prints in A4 format. Many of you will know that I have been battling with Chronic Fatigue Syndrome (CFS) for several years. I left my full time management job a couple of years ago to rest and recover. I naively thought 6 months should do the trick. Two years on and CFS is still very much a part of my life. So, fed up with trying to plan for a future that *might* happen if I got well, I started focussing on the present. The quote above has been very meaningful for me, and has led me to this point of re-opening my Etsy shop. I started focussing on doing what I can, with what I have, where I am now, at home. For me, this meant building on the photography that I know and love, and developing some design skills. My chronic fatigue has been (is) a great teacher, and I'm grateful for the many lessons learnt and ongoing. I wanted to find a way to share some quotes and phrases that have been helpful and meaningful to me on my journey to recovery, and hopefully find a way to inspire, uplift and gently encourage others. So the idea for this range of prints was born. I'm hoping to add to the range over time, so do let me know if there are any particular quotes or phrases you'd like to see in poster format. The prints are A4 in size and have been professionally printed on beautiful heavyweight 300gsm paper with a satin finish. The text is smooth and crisp in print (it can look a little jagged in the previews). The paper is nice and robust and is well suited to putting up on your walls with washi tape, providing a lovely economic way of displaying it. I have a grid of 9 prints on the wall above my computer and they look fantastic. I'd love you to pop over to my Etsy Shop to see the full range. I'm offering my lovely blog readers a 10% discount on the prints with code LAUNCH10: www.etsy.com/uk/shop/zoepower (valid until 25 October 2015). I'm also hoping to add the prints as digital downloads in the coming weeks, which might be a more economical way to purchase them for those of you who are overseas. My Red Bubble shop is still operating and offers a wider range of my photographs in lots of different formats, including postcards, greeting cards, phone cases, tote bags, cushions, pouches and more. Red Bubble print to order and despatch items directly to you (usually from the USA), so this allows me to offer a wider variety. I'd love to know what you think of the new inspirational quote prints - comments and questions are always very welcome.